‘One of the best detective story writers of all time’ - Hugh Greene, The Rivals of Sherlock Holmes. Freeman draws on his own experience as a colonial surgeon and lab technician to bring a new level of realism to the genre. Credited with inventing the first forensic detective novel, while retaining a narrative style reminiscent of Arthur Conan Doyle, the novel was groundbreaking in its approach of employing new crime analysis techniques as plot points, including the first known use of fingerprinting. Considered one of the most significant developments in crime fiction since the advent of Sherlock Holmes. A lauded and listed collection of five stories, beginning with The Case of Oscar Brodski, by the ‘true and undoubted ‘parent’ of the scientific detective story in the highest meaning of the phrase.’ (Haycraft, Murder for Pleasure.) 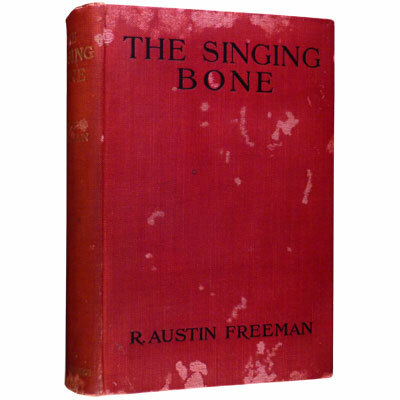 First edition, with misprinted quotation mark on the title-page. Symons in Murder for Pleasure stresses the originality of this collection of short stories, in which we see a crime committed, and then watch Dr. John Thorndyke discover and follow clues that lead to the criminal, a concept known as the ‘inverted tale’. Symons also admired Freeman’s accuracy in detail, a result of Freeman’s medical training and perhaps his work as a medical advisor at Holloway Prison, and Haycraft points out that no other literary criminologist has been paid tribute of having his fictional methods put into use by the real police. These ‘Freeman 'inverted' tales were a monumental contribution to the development of the detective story, and from them have stemmed some of the great modern masterpieces of crime writing.’ – Ellery Queen, Queen’s Quorum. A Dr. Thorndyke mystery, scarce inscribed, more so with a dust jacket in such nice condition, the book itself is fine.